I know...bad blogger....it's been busy. 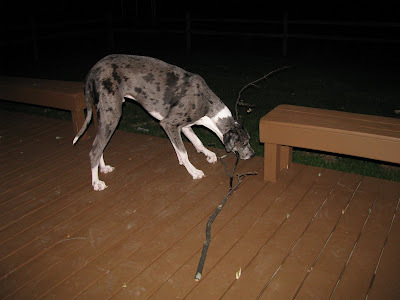 Here's Bu and the limb that he thought should be able to come into the house after it fell from the tree. I hear this horrible scrappy noise...and go look and he was trying to fit through the door. Unfortunatly I didn't get that picture. He wasn't happy when I wouldn't let him bring his prize in the house.